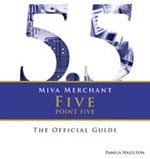 Miva Merchant will offer Pamela Hazelton’s eBook, The Official Guide Second Edition Miva Merchant 5.5 PR 7-PR8, free to all licensed customers! If you’ve been involved in the Miva Merchant community for any amount of time, you’ve probably heard about or have purchased Pamela Hazelton’s Miva Merchant Books for older versions of Miva Merchant in the past. Check out the press release for the latest Official Guide Second Edition Miva Merchant 5.5 PR 7-PR8 book.